Eastern Dragon is a simple slot in many ways. First of all, it has a standard layout of five reels and three rows, as a result of which it resembles the lion's share of online slots. Secondly, the slot makes heavy use of standard symbols, which range from the nine to the Ace. And even though this might seem a bit boring, it does help with keeping a clear overview, and, thus, keeping it easy to see when a win is forming. You can encounter dragons on the first and fifth reel. These dragons function as wild symbols and can, thus, substitute for any other symbol except the scatter. 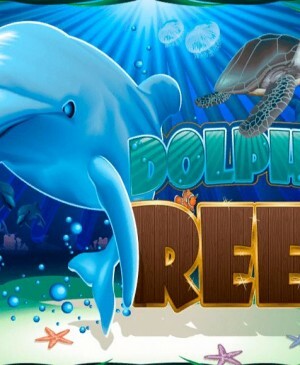 Please do note that the scatter in this game does not lead to free spins; the wild symbol does that. Additionally, all wins the wild symbol is involved in will get doubled. 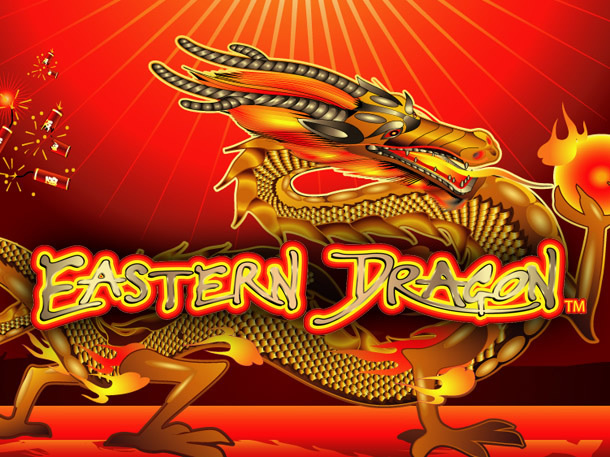 Eastern Dragon is a simple yet good-looking slot by software developer NextGen Gaming. It is one of the many slots by this developer that has a standard layout. Luckily, however, this doesn’t necessarily have to be a bad thing. That is, if you’re looking for a slot that is easy to play without having to focus too hard, Eastern Dragon might definitely be a great fit for you. 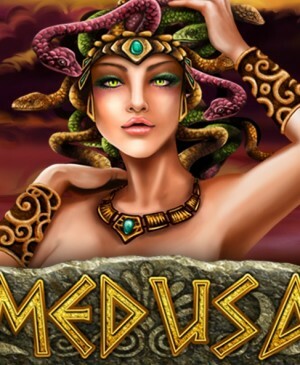 The slot is equipped with free spins and it has a wild symbol; the only two features this game has. If you don’t count the gamble feature as a real feature, that is. It’s up to you to whether you want to make use of this feature anyway. How to play Eastern Dragon? Eastern Dragon is a simple slot in many ways. First of all, it has a standard layout of five reels and three rows, as a result of which it resembles the lion’s share of online slots you can find online. Secondly, the slot makes heavy use of standard symbols, which range from the nine to the Ace. And even though this might seem a bit boring, it does help with keeping a clear overview, and, thus, keeping it easy to see when a win is forming. You can encounter dragons on the first and fifth reel. These dragons function as wild symbols and can, thus, substitute for any other symbol except the scatter. 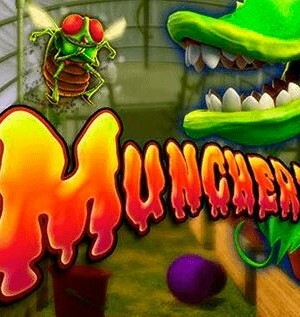 Please do note that the scatter in this game does not lead to free spins; the wild symbol does that. Additionally, all wins the wild symbol is involved in will get doubled. 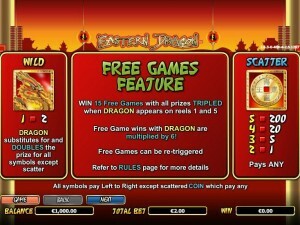 Free spins are the definite highlight on Eastern Dragon as all wins will get multiplied by three. So, when a win involving one of the dragons forms, that win will get multiplied by 6x! In order to reach free spins, you will need a dragon on both the first and fifth reel. 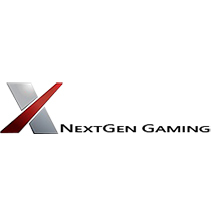 You will receive a total of 15 free spins that will prove to be able to significantly increase your account balance. When you’re spinning for free, background music starts playing, making sure you know something is going on, and you will even win additional free spins when the dragons land on the first and fifth reel again. Eastern Dragon is fitted with a total of 20 pay lines and it’s probably wise to play on all of them, seeing as the slot has wild symbols and a multiplier. However, you can still decide to dial down the number of active pay lines, which you can do at the bottom of the slot or by clicking your preferred number alongside the playing grid. The slot is also equipped with a standard gamble feature and an autoplay. You can configure the number of automated spins, but you cannot let the autospin turns itself off automatically once you reach free spins. Therefore, it’s best to stay close to your device as only then you’ll be able to know when wins will start to come in fast.